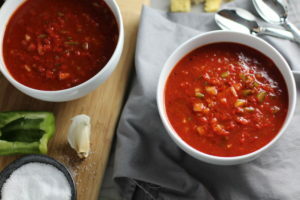 This Roasted Red Pepper Gazpacho recipe is perfect for all Seasons. It’s cool, tangy, crunchy, fresh, and even creamy. Is it a soup? Is it a salad? I say, why put labels on this wonder bowl. It’s just amazing. 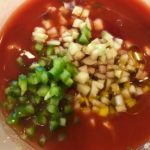 Gazpacho was a staple on my appetizer menu when I was catering in NYC and clients loved it when it was served in shot glasses – so cute! 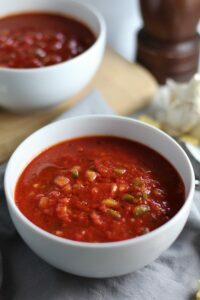 Back then I did a very traditional Gazpacho recipe, but I wanted to change it up for this recipe. 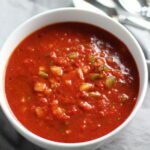 Here, the base is still tomato, but this Gazpacho recipe puts Roasted Red Pepper in the starring role, which is what sets it apart from the more traditional gazpacho. The red pepper brings another layer of creamy sweetness to this soup. Then you get the crunch from the green pepper and cucumber. Finally you get the peppery bite from the garlic and scallions. The great thing about this soup, aside from the amazing flavors, is that it doesn’t need to cook! You simply dice, chop, slice, mix, and set in the fridge! 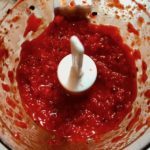 That said, you do need to do this a day in advance so that all of the amazing flavors can come together and infuse the tomato juice. Let’s start with the base of this soup. 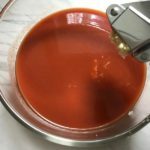 Tomato Juice is the starting point, the canvas with which we paint our delicious Gazpacho recipe upon. The tomato juice is light, not too thick, so it’s a perfect backdrop to our soup. You could use a vegetable juice, such as V8, as long as the primary ingredient is tomato and it looks and tastes like tomato juice. Next comes the garlic. The garlic must be minced. I mean really minced or else you risk getting a raw piece of garlic in a bite and that may not be very delightful, if you know what I mean :). To ensure I get a good mince easily, I use the OXO Good Grips Soft-Handled Garlic Press . 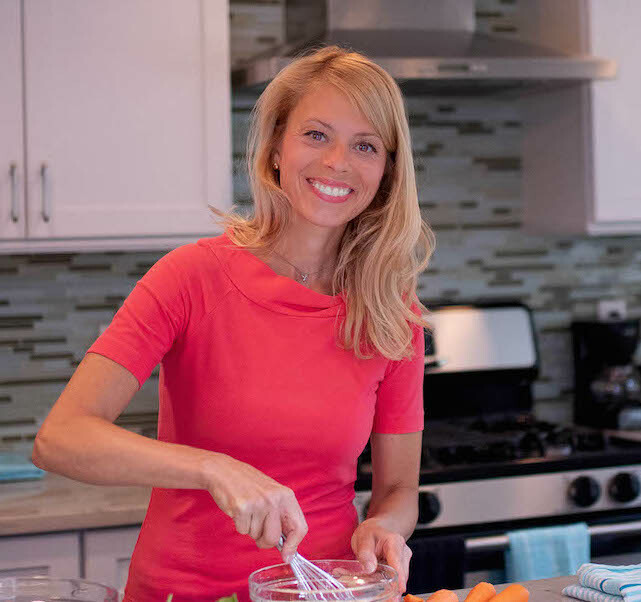 It seriously makes mincing garlic so easy and it’s also easy to clean and just put into the dishwasher. Red Peppers are the star! As the recipe title implies, Roasted Red Peppers are the star here. You need a 12oz jar of roasted red peppers. You can certainly roast your own red peppers, by charring them over a flame and then putting them in a plastic bag to steam and then wiping the skin off. You will need 1 very large or 2 smaller red peppers to equal the amount you get in a 12oz jar. 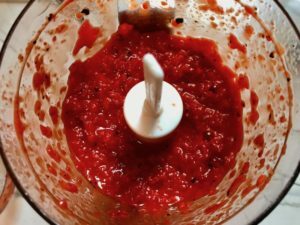 Simply drain and put the roasted red peppers in a food processor and blend until smooth. It’s fine to have it slightly chunky, in fact that’s how I like it in this recipe! 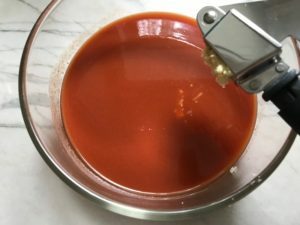 Add the blended red pepper to the tomato juice. 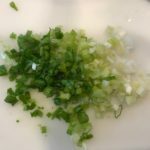 Finely slice the scallion, dice the cucumber, and dice the green pepper. Add all to the tomato juice, garlic, and red pepper. Mix and then add in the red wine vinegar, olive oil, salt, and pepper. Mix again and taste for seasoning. Add salt and pepper as needed. Then store in the fridge overnight so that all of the flavors come together. 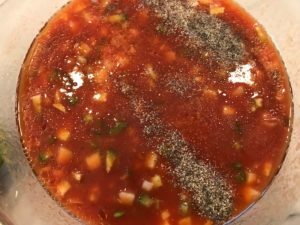 The next day, once again taste for seasoning, as all of the flavors have now come together as one beautiful, thick, chunky, delicious soup. You probably won’t need to, but add Salt and Fresh Ground Pepper to taste. Serve in bowls and garnish with a drizzle of extra virgin olive oil for the final finishing touch. ENJOY! This Roast Red Pepper Gazpacho recipe is Summer in a bowl. It's cool, tangy, crunchy, fresh, and even creamy. 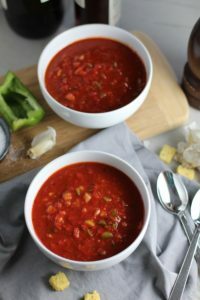 The base is tomato juice, but this Gazpacho recipe puts Roast Red Pepper in the starring role, which brings another layer of creamy sweetness and is what sets it apart from the more traditional gazpacho. Then you get the crunch from the green pepper and cucumber. Finally you get the peppery bite from the garlic and scallions. 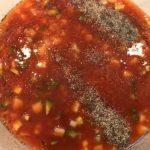 Prep Ahead for your Gazpacho Recipe - you should do everything ahead so the flavors can come together overnight. To a large mixing bowl, add the tomato juice. Mince the garlic with a garlic press or with with a knife. Add to the tomato juice. 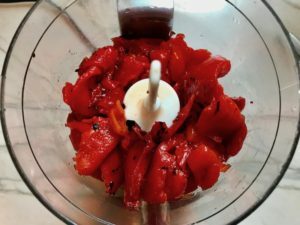 Drain the roasted red peppers and add to a food processor. Blend until smooth. Add to the tomato juice. 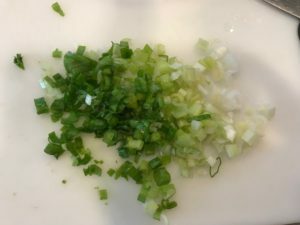 Finely slice the scallion and add to the tomato juice. Finely dice the green pepper. Finely dice the cucumber. Add both to the tomato juice bowl. Add Salt, Pepper, Olive Oil, and Red Wine Vinegar. Then mix to combine. Let sit in the refrigerator over night so that the flavors all come together. The next day, taste again for seasoning and add salt and pepper as needed. Serve in bowls and drizzle extra virgin olive oil for the final finishing touch. Enjoy! I love that you made Roasted Red Peppers the star of this dish. Such a great idea. I will definitely have to try this. Thanks for posting. Hi Kristy, Thank you so much! 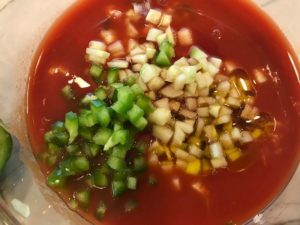 It’s a fun and delicious spin on a traditional Gazpacho.